I was determined to find my cousin’s name on The Wall That Heals when it came to Cookeville last month. It was a rainy Sunday afternoon, just hours before the wall would begin the journey to its next stop, before I made it out to the Putnam County Sports Complex. Despite the weather, the site was teeming with visitors. Like me, many of them had “rubbing paper” and pencil in hand. With the help of a kind volunteer, I found the name William Matthews Fernandez (“Buck” to friends and family), SFC U.S. Army, in the wall directory. The volunteer helped me locate panel W5, line 119 and held an umbrella over me while I made the rubbing. I discovered more information about Buck, my mother’s first cousin, on the internet. Born April 30, 1938. Died February 19, 1971. Body recovered. Casualty type: Hostile. Died outright. Air crash over land. My memory took me back to the winter of 1971. The whole family was, of course, devastated at the news of Buck’s death. Lack of information about the circumstances made the tragedy all the more painful. Buck was carrying no personal ID when he died, but in his pocket was a ten baht gold chain and Buddha he’d promised to keep safe for a buddy. There was no question that the body recovered from the right seat in the scorched wreckage of the A-02 Skymaster plane belonged to Buck. The men who found him knew him. 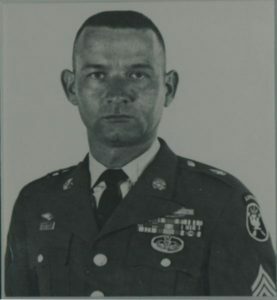 One of his fellow soldiers wrote that “nearly every bone in his body was broken…we literally rolled up his legs and stuffed him into the body bag.” But the lack of official ID was enough to allow his mother, my Aunt Billie, to hold out hope that one day she’d see her oldest son descending the steps of a troop plane, smiling and intact. That didn’t happen. My cousin Billie Jo, Buck’s sister, recently filled me in on the details of his death. Many years after it happened, when information about it was finally declassified, the family learned he’d been on a Special Forces information gathering mission near the Ho Chi Minh Trail in Laos. He was the Covey Rider in a plane piloted by Larry Hull. Flying low above the treetops, Larry and Buck led a team of rescue-and-recovery soldiers through dense jungle to a spot where, hours earlier, there’d been a blood bath between U.S. and North Vietnamese forces. Buck radioed for an extraction helicopter as Larry steered the plane into a sharp left-hand bank. Moments later, they were hit with heavy enemy gunfire. The plane crashed. Neither crewman survived. Though Buck’s remains were quickly recovered, Larry Hull’s body was pinned so tightly in the aircraft that it couldn’t be removed. In 2006, 35 years after his death, Hull’s remains were finally recovered and buried at Arlington National Cemetery. Think Memorial Day is all about cookouts and pool parties and a day off from work? Think again.